FILE - Saudi Crown Prince, Mohammed bin Salman attends the second day of the Future Investment Initiative conference, in Riyadh, Saudi Arabia, Oct. 24, 2018. After months of absence in London, senior Saudi royal Prince Ahmad bin Abdulaziz arrived Tuesday in Riyadh, prompting conjecture among Saudi expatriates that older members of the Gulf kingdom’s ruling family are ready to assert themselves in the wake of the murder of Saudi journalist Jamal Khashoggi. Some London-based Saudi expatriates with ties to the royal family say the septuagenarian Ahmad, who was the Gulf kingdom’s heir apparent until his brother, King Salman, altered the line of succession, may press for convening a family council to discuss how to control the fallout from Khashoggi’s murder. 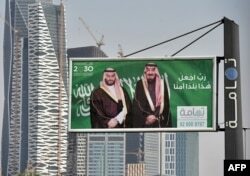 They say Ahmad is likely to lead an effort to curtail the power of Crown Prince Mohammed bin Salman, widely referred to as MBS, and argue for the appointment of a senior royal to act as a "guardian" for the crown prince. A still image taken from CCTV video and obtained by TRT World claims to show Saudi journalist Jamal Khashoggi, highlighted in a red circle by the source, as he stands with his fiancee Hatice Cengiz outside the Saudi Arabia's Consulate in Istanbul, Turkey. Self-exiled dissident journalist Khashoggi was killed four weeks ago in Saudi Arabia’s consulate in Istanbul, where he had gone to collect documents allowing him to remarry. His murder by Saudi agents, some who have served as bodyguards for the crown prince, was belatedly acknowledged by the Saudi government after leaks to the media by Turkish officials who gave details of the murder. Turkish police gather outside the residence of the Saudi consul General Mohammed al-Otaibi to conduct a search after the disappearance and alleged slaying of writer Jamal Khashoggi, in Istanbul, Oct. 17, 2018. Riyadh first claimed Khashoggi left the consulate alive, but was later forced to admit the dissident commentator had been killed. Riyadh maintained the killing was a rogue operation by renegade security and intelligence officials and not a mission endorsed by MBS. That explanation has been met by widespread international skepticism, including from U.S. President Donald Trump. The London-based news site Middle East Eye reported Tuesday that Ahmad had held discussions already with other members of the Saudi royal family living outside the oil-rich kingdom. VOA reported last week about a series of Khashoggi-related discussions involving princes sidelined by MBS and who bear the crown prince a grudge. FILE - A photo of the the Ritz-Carlton Hotel taken in Riyadh, Saudi Arabia, Jan. 23, 2016. Last year, when MBS started to consolidate his hold on power in the kingdom, he launched a sweeping purge of rival royals, detaining 11 of them, but none of the sons of King Abdulaziz, the founder of the modern Saudi state, was touched. Two weeks ago, Saudi Prince Khalid bin Farhan al-Saud, a senior prince who lives in self-imposed exile in Germany, called publicly for King Salman bin Abdulaziz to abdicate in favor of Ahmad, the 31st son of the founder of Saudi Arabia.The monarch needed to abdicate to “save what remained of his dignity,” he told Germany’s DW TV. Even before Khashoggi’s murder, there had been talk in Saudi expatriate circles that Ahmad was ready to become outspoken in criticism of MBS’s policies, especially over the war in Yemen and his eschewing of traditional rule-by-family-consensus. 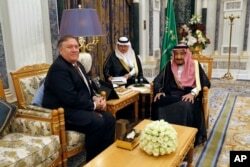 FILE - U.S. Secretary of State Mike Pompeo, left, meets with Saudi Arabia's King Salman in Riyadh, Saudi Arabia, Oct. 16, 2018. Analysts are divided on whether King Salman will curtail his son, reduce his powers or even replace him. To do so would indicate dangerous weakness, reflect badly on his judgment to make MBS the next in line, and invite further demands from other disgruntled senior members of the royal family, say some skeptical analysts and diplomats. Others say that if the crisis cannot be brought to a conclusion quickly, then there will be serious political repercussions within the kingdom, including possibly a challenge to MBS’s day-to-day rule. “There are movements and there are signs that a dialogue is taking place within the royal family,” says Khalil Jahshan, a friend of the slain journalist and director of the Arab Center, a research group in Washington. Pressure in the coming days is likely to mount on the Saudis over the murder and on Western countries to insist on the full truth coming out. Hatice Cengiz, fiancee of slain Saudi journalist Jamal Khashoggi, is seen during an interview with Reuters in London, Britain, Oct. 29, 2018. On Monday, Khashoggi's Turkish fiancée, Hatice Cengiz, said she was disappointed by the Western response so far to his murder and demanded the Saudi authorities reveal where the journalist’s body had been dumped. Speaking at a packed memorial event in London, Cengiz said she held the Saudi government responsible for her fiancée’s killing and called on the “evil criminals and their cowardly political masters” to face justice.